Normally when I put together an outfit, I look at the end result and, providing it looks ok, I forget about what I am wearing. The clothes just become a part of me and I carry on with my day or evening without further thought. Sometimes though, you find an outfit that makes you feel special. The kind that you really do feel pretty in. The kind of outfit that makes you smile to yourself. You know the kind I mean. 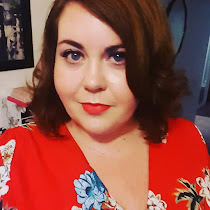 Recently SimplyBe kindly let me review some pieces for them and I jumped on the AX Paris Sleeveless Floral Prom Dress like a vulture. Having already seen this dress worn by Mhairi of Lilybobombslovelylumps I had admired it then was curious if it would suit me. I wasn’t sure whether this dress would suit my body shape or even have a good fit as usually anything button up fits badly on me. I usually end up having to undo too many buttons and AGAIN use the slip under the dress trick. I need not have worried as it buttons all the way to the top if I want it to and it fits just right without any pulling anywhere. I am wearing the dress, it doesn't wear me. I feel fantastic in this dress. It makes me want to waltz around the room like Maria from West Side Story singing “I Feel Pretty”. It is floaty and feminine and fits just right. Any dress that makes you feel like that is a special thing indeed. The Floral Prom Dress is available from Simply Be in sizes 12 to 32 for the price of £35.00. Do you have a dress that makes you feel like that? I have not been paid to write this blog and the opinions in the same are honest and my own. Thank you lovely!!! It's my first bright print dress that I've worn out in public believe it or not. It will be trialled at a house warming tonight.